P A I N ... P A I N ... the hue and cry ... transformation be its call... within lies the Power of Awareness, the Instinct to respond to Need... heed its messaging... cells in responsive protection... 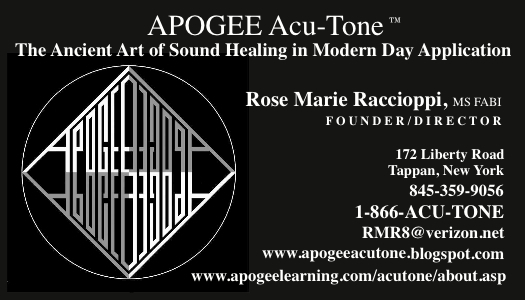 This the art and science of APOGEE Acu-Tone™ ... reestablishing harmonic cell communication... restorative frequencies to relieve pain, activate healing, and rebalance discordant energies. Thrilled with the ongoing results of benefit and well being. ALL inquiries Welcomed. Upon entry it was observed that the eyes were not aligned, one appeared smaller than the other, one eyebrow higher than the other, a dull affect was evident and reported as feeling stressed, confused, not oneself. Through direct body biofeedback, (Re: Kinesiology) it was determined which energy centers were functioning in a compromised state. Discussion followed that identified the circumstances and the persons perceived as being problematic. Steps defining resolve were explored. The called for restorative frequencies were determined, applied to cranium points, ear acupuncture points, and reflexology points on both hands and feet via calibrated tuning forks. This was followed by a 'sound shower' of 528 Hz and 999 Hz. Focused attention on specific joint areas of the body, followed by whole body breathing, brought the session to a close.